oh pretty! love that style! I love the colors. Very happy and bright. Love the colors and the energy they bring. I really like the mix of modern and country. I think that must be my style. 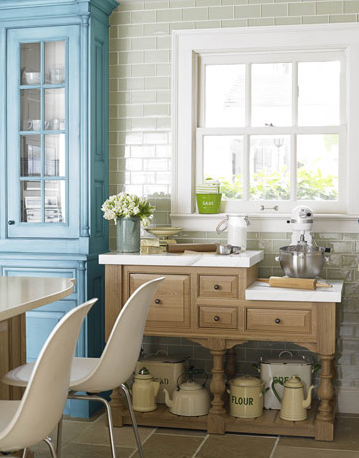 love the white subway tile, one of my favorites. Love that soft gray subway tile! That is gorgeous. It is actually the exact dream kitchen that I have in my head. My favorite part of the pictures though is the cheese bowl on the counter in the first picture with the fruit in it! Thanks for sharing. I'm writing a quick blurb about it in my blog now to share with others! modern plus rustic is my favorite combination. slowly learning to incorporate them in my bungalow on a teensy budget! Thanks for sharing this!